Do you have a teen who loves roller skating and little bit of punk style? Then a roller derby birthday party may be the perfect theme! Roller Derby is a contact sport played on roller skates where two teams of 5 battle each other in a race around a track. There are many different rules, regulations and special plays in roller derby. Click here to read all about it on Wikipedia. Here you’ll find ideas for invitations, decorations, activities and treat bags. Hot pink and black are fun colors for a roller derby birthday party. 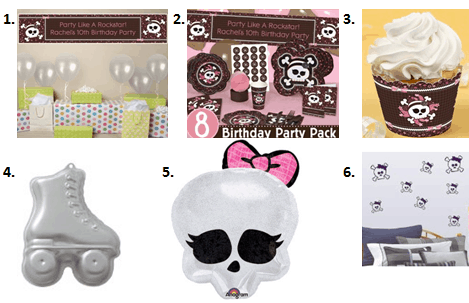 The feminine skull theme can be carried throughout the decor as well with balloons, banners, wall decals, tableware and cupcake wrappers. Black lights with white decor or a dim room with disco lights also helps to set the scene for this theme. The guests could having fun dressing up and then pose for a group birthday photo. This photo would be a great addition to a thank you card. How are your roller skating skills? I haven’t been since I was a child…and I wasn’t too good at it back then so I can only imagine how I’d do today! We often add new party ideas perfect for teens and tweens. Stay updated on the latest ideas by following us on Facebook, Twitter, Pinterest and Bloglovin’. **Disclosure: I am part of the Tiny Prints, Inc., Big Dot of Happiness and Amazon affiliate programs. All opinions expressed here are 100% my own.